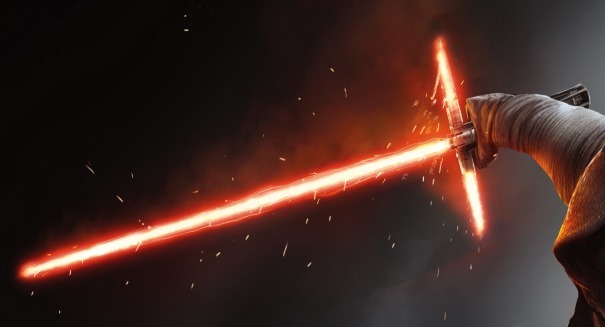 Despite recent breakthroughs in military technology, a team of researchers explains why light sabers just aren't meant to be. In case you haven’t heard, this week marked the release of the latest Star Wars movie, Episode VII: The Force Awakens. The Star Wars craze is back in the air, and even the military has shown a keen interest in some of the laser systems depicted in the new film. According to a report from Fox Tech News, American defense contractors are hard at work developing new weapons systems for planes, drones, land vehicles, and even boats for the U.S. military in an attempt to fully harness the power of lasers. While they may not be as epic as some of the cannons fired in Star Wars, Boeing is hard at work developing a laser system that could shoot drones right out the sky. The Compact Laser Weapon System is a smaller, more portable version of the company’s High Energy Laser Mobile Detonator. The laser shoots a focused beam of energy that can burn a hole in an approaching drone, forcing it to fall from the sky. Not to be outdone, fellow contractor Lockheed Martin is currently working on a laser turret that would be mounted on top of fighter jets traveling close to the speed of sound. The laser turret would have a 360-degree range, and would truly be a force to reckon with. So far, the laser turret has been tested on roughly 60 flights. Lockheed has been working with DARPA and the US Air Force to develop the laser system. Other laser projects in the pipeline include a truck-mounted laser built by Northrup Grumman that can deliver 10 kilowatts of solid-state power, and a seaborne laser weapons system called the Area Defense Anti-Munitions, or ADAM system. But what about the one Star Wars weapon that stands out in every fan’s mind? A team of researchers from the University of Queensland ARC Centre of Excellence for Engineered Quantum Systems has broken down the science behind the infamous light saber, revealing that the weapon may forever remain the stuff of fantasy. A light saber is supposedly made from plasma, or a gas that has had its electrons stripped away. It would be nearly impossible to confine this plasma without using an external guard, which would block the saber’s destructive power altogether. A real-life light saber would also require an extremely dense power source. Despite the technological roadblocks to building a real light saber, weapons technology is progressing towards the use of lasers rapidly. It may not be long before they take over the entire defense industry.